Chronic disease may itself cause anemia. Common chronic disease which lead to anemia may include malignancy (colorectal carcinoma), infection, connective tissue disorder ( SLE) and inflammatory disease ( inflammatory bowel disease such as Chron’s disease or ulcerative colitis and rheumatoid arthritis). 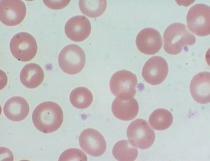 Anemia of chronic disease may present with signs and symptoms such as pallor and fatigue. However in most cases no treatment is required. Blood transfusion or erythropoietin is only considered in severe cases of anemia of chronic disease. 1.Sears, D A. “Anemia of Chronic Disease.” The Medical Clinics of North America 76, no. 3 (May 1992): 567–579.